Gone are the days when everyone looked upto a corporate job. Times changed. Now people are moving towards entrepreneurship. Even the home-makers try to find out ideas for starting up something though at a small scale initially. And the best place to start up your business is undoubtedly home. There are a lot of benefits of having an office at home – no or less start-up cost, no rent, you are at a place that puts you at ease and a lot more. Like you decorate and design your house that shows a part of your persona. Similarly, it is equally important to design your office in a way it feels like home to you and your staff but at the same time making it professional as well. It should also speak about your personality. Planning interiors of home office is important and you can experiment depending on its area. 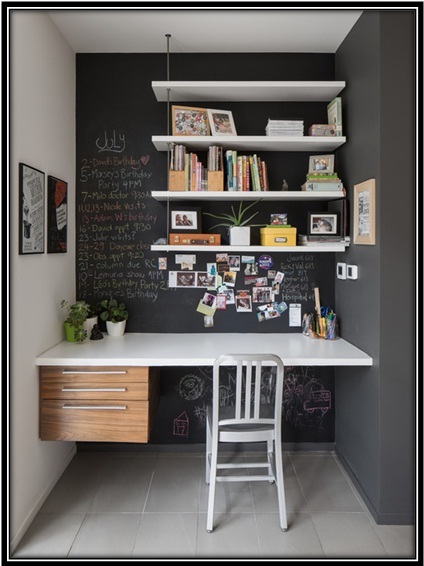 However, there are a few simple and standard tips you can definitely make use of before starting the design of your home office. 1. Furniture – you can avoid using the official or universal office furniture. A dining table can act as a very comfortable table for work. Use bean bags or arm chairs and make the seating comfortable for clients as well as the people who work for you. You can also have a coffee table and chairs or even stools. 2. Experiment with Colors – avoid using single colors. Workplace should be livelier for the simple reason you spend entire day here, brainstorming, discussing and planning projects. There is no room for dullness in any way. So keep the colors bright. You can even have a wall painted to be used as a blackboard. 3. Let the Lights in – lights play an important part when it comes to designing. Make sure you have enough light all day long. Have a space for windows and hanging lights right above your desk and in the corners will make your home office even more stylish. 4. Positivity – it is said that positivity is the key to success and it is also scientifically proven that plants have a positive effect on workplace apart from giving fresh air. Plants act as productivity boosters. So having a few pots hanging or simply a small pot at the desk or at the entrance is advisable. 5. Storage – having cabinets (either built-in or movable) is quite boring and monotonous. Why not experiment with the storage!!! 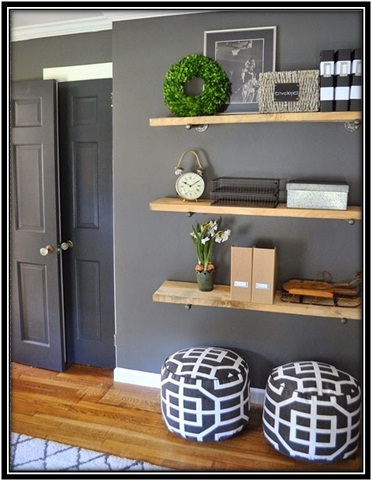 Having floating shelves will let you display your work and also let you store important books and notes without sacrificing on floor space. It also makes your wall intriguing. 6. Make it Personal – in the end your home office must reflect your personality and speak volumes about who you are. Make it personal by putting up displays you purchased in your last travel. Something that you like the most or anything that makes your work place exclusively yours. 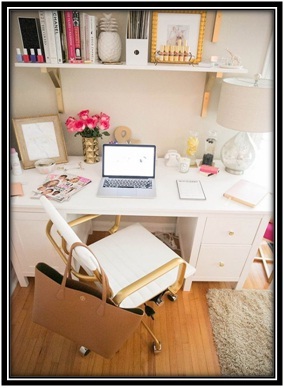 Since you have taken the big step of being an entrepreneur, we wish you Good Luck and hope the above shared insights help you make your Home Office stylish yet very productive.